Saw these on Ebay today. Might be of interest to someone here. How did they mount these tracks on the Model T? Hey David, there are several threads about the Snowmobiles. Here is a good one with good pictures, just make sure you scroll down far enough to see them. First few pics don't look promising. The modern vehicle equivalant can be found at www.mattracks.com. I've been lusting after a set of these for a few years. I just don't have a 4 wheel drive truck to put them on. Sorry, it's very OT but Mattracks are probably one of hte coolest things I've ever stumbled upon on the internet. Seth, Iv seen them on farm tractors but never on a truck or atv. If I still lived in the country I could see me investing in a set of them for an atv. They are so cool I can hardly stand it! They have some videos on youtube and maybe still on their site of the tracks in action. They basically turn any vehicle into an advanced moon rover capable of going anywhere short of hanging upside down. There's one where a truck comes up to a concrete loading dock that is 36" high (maybe a little higher or lower, but way taller than the mid-point on even a large tire), it's just a flat face that the truck approaches and then just scales over it like it's no big deal. You could literally go ANYWHERE. The other part that is INSANELY cool is when a Dodge Ram 2500 drives over 4 feet of snow. They have a person who is up past their waist trudging through the snow, and then the truck zips by and compacts the snow maybe 2 or 3 inches. The guy climbs up on the trail where the truck drove, and then steps off beside it back to waist deep. It's so freaking cool. *disclaimer: I don't know the folks who make them or anybody who works there, I just found them online and think they are one of the neatest bolt-on inventions ever. So did anyone here win these????? I picked them up for Bob McDonald who does not do eBay. Sweet! Glad I was able to give that earlier heads up. Those tracks are the early design by Mr White just about the time he started to use the name Snowmobile Co. (Automobile Snow Attachment Co ) before that. Some where between 1917 and 1922 when they went to the steal tracks. those will go on my next project to redo my first one the 1916 pie wagon. 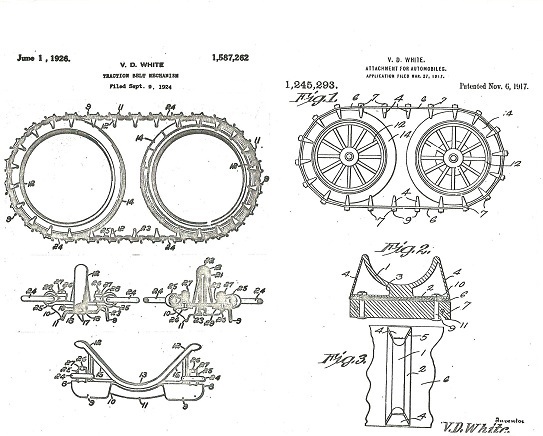 1917 first patent drawings on right. Thanks to all of you for the heads up and the help in getting them. Bob, I was hoping they found a home with you. Congrats on being able to put a setup together.